Can we Have more Categories Please! That is the question I get asked the most when it comes to the Podcast Awards. My response is that each category cost close to $400.00 if we want to keep the standards high. The trophies we have made each year are custom designed. They are produced by the same company that produces the Country Music Award Bullets. 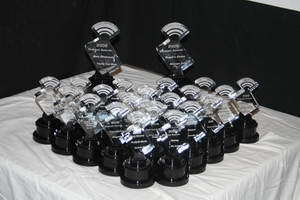 Any podcaster that has received one of these beautiful trophies will tell you that they are amazing. We have them laser engraved as well. I would love to add categories but we need people to get out their wallets in advance of the 2010 event and step up to the plate. The 2009 Podcast Awards show slate is finalized and I hope that we can get it validated, announced and online later today. Possible will do an official announcement on Sunday at the latest. Each category took our 40+ reviewers over 5 hours each. This is the longest it has ever taken to review the shows. Frankly I was getting a bit nervous. But it is done and I think the slate looks pretty amazing. Should be a great voting period as there will be some serious competition in almost every category. This is the recording of the 2008 Podcast Awards.